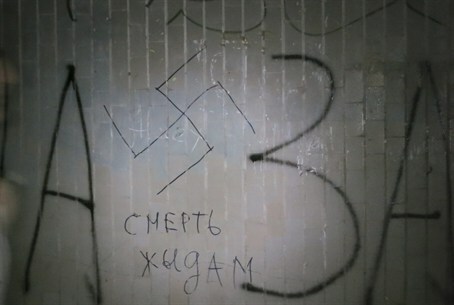 In the latest anti-Semitic attack in the Ukraine, vandals on Friday sprayed swastikas and graffiti reading "Death to the Jews" on a synagogue in Simferopol in the Crimea region, reported the Israel Hayom daily newspaper. "There is no doubt that it was important to anti-Semites to commit this crime," Anatoly Gendin, head of the Association of Jewish Organizations and Communities of Crimea, told the newspaper. "Since the crisis started, prices have risen by 30 percent and people aren't receiving their pensions. As always, the Jews are being blamed, and I'm scared to think where it could progress," he added. The anti-Semitic incident in Crimea took place the same day that the Russians began to take over the peninsula. According to the Jewish community leader, to get to the building the vandals had to climb the 2-meter wall that surrounds the synagogue compound. Rabbi Misha Kapustin, a leader in the Crimean Jewish community, told Israel Hayom that he had asked worshippers to stay away from the site. "This was the first time in my life that a synagogue was closed," he said. "I realized that the situation wouldn't get better. We don't need to wait for them to riot against us." Rabbi Kapustin added that intends to write a letter to a number of heads of state, appealing to them to do "whatever is in their power to prevent a Russian invasion. To [ask them to] not abandon Ukrainian Jews." Anti-Semitic incidents have been recorded in Ukraine for many years, but have been on the rise recently, in the wake of the unrest there that toppled Viktor Yanukovych. In January, unknown assailants stabbed a hareidi man in Kiev as he was making his way home from synagogue on a Friday night. As the political situation in the country worsened, reports indicated that extremists have been targeting the Jewish community in Ukraine, including a member of the opposition. A synagogue southeast of Kiev was firebombed last week by unknown assailants. At the same time, reported Israel Hayom, other voices are also making themselves heard in Crimea. A representative of the pro-Russian party that controls the Sevastopol city council said that "there are no soldiers or armed people in the streets. There aren't a lot of Jews here, but those who are left can relax." The Rabbi of the city of Kharkov, Rabbi Moshe Moskowitz, told Arutz Sheva last week that a number of local Jews have already expressed a desire to leave Ukraine and emigrate to Israel. The unrest of recent month is what has brought this desire to the fore, he said. MK Rina Frankel (Yesh Atid) has called on Prime Minister Binyamin Netanyahu to launch an emergency aliyah operation to bring Ukrainian Jewry to safety as a result of the unrest.